We have arrived in Amman, Jordan. expanse of Saudi Arabia and circling the Jordanian desert for half an hour, my Royal Jordanian Airlines flight landed at Queen Alia International Airport. sojourn) in “Downtown”, the oldest part of the city. 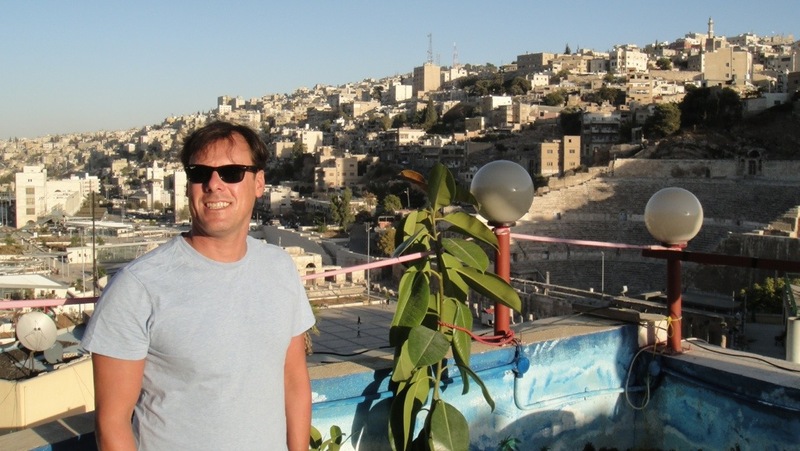 So old that when we stand on the Amman Pasha Hotel’s 6th floor roof terrace, we have a view of a 4000 seat Roman Amphitheatre in front and the Citadel – which dates back 7000 years – rising behind us. word is “chaotic” – from the Spanish student here to learn Arabic who took my order, to the Arabic music that swings from ‘atmospheric’ to ear-bleeding loudness. I understand now the sign on the wall “Hang out for deaf and mute in Amman”. I had seen a group of men signing out the front of the restaurant. They don’t know how lucky they are. in. The tables and chairs are covered in tribal fabrics; the walls adorned with photocopied pictures of the Jordanian Royal Family, Bill Clinton, Frank Sinatra, Dean Martin and … Mr Bean?! The windows are stained glass (and also stained with nicotine) and the bar decoration is a mixture of Shishas (large hookahs for smoking a legal concoction in … more about that later), elaborately coloured cushions and Vegemite jars. (The owner lived in Perth for 20 years!) It’s eclectic, but atmospheric, to say the least. This city is nothing but hills, surprising considering the surrounding area appears to be nothing but flat desert. The Citadel is a combination of Roman and Umayyad ruins perched on the flat top of the large hill immediately behind our hotel (looking out the window at it now, in fact!). 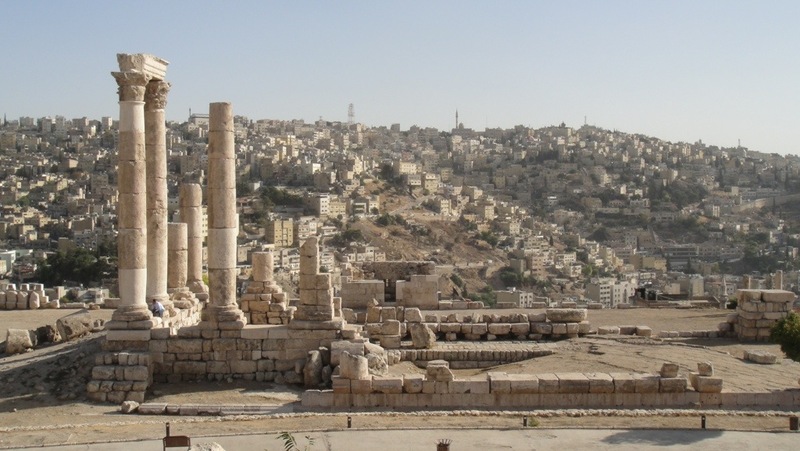 The Temple of Hercules and its remaining white stone columns tower over downtown Amman. That’s me at the bottom left. Hercules was obviously pretty special to the people who built this Temple to honour him! The original city is comprised of a series of seven hills that surround the Citadel. Each hill is covered in flat-roofed square buildings, all constructed from local sandstone. No colour; everything is the beige colour of the surrounding desert – the government doesn’t want new buildings to distract from the historic old part of the city. Now I love history, and I’m first to argue the case for preservation. But Amman has no greenery, which makes for quite a bland landscape. Arabic music blaring from almost every shop. I kind of fell in love with the place. Then there is the Shisha. Another sweet smell that emanates from most of the coffee shops. Think Amsterdam; think smoke-filled rooms; think bongs on steroids. Don’t know what a ‘bong’ is? Google it, or ask your nearest and dearest hippy. As my Indian friends say, “same-same, but different”. Imagine a water-filled ‘I Dream of Jeannie’ glass vase, with an 80cm pipe sticking up from it. The pipe has a brass cone the size of an espresso cup on the top. Into this cone is placed red hot coals and a sort of solid gum. The coals slowly burn the gum. Remember that glass vase? It also has a long flexible hose coming from it with a mouthpiece that you draw the smoke through. The gum is flavoured, and our menu had a vast selection to choose from, including two apple, cinnamon and lime, watermelon, peach and other exotic offerings. I didn’t do a Bill Clinton … I did inhale. Yep, even my squeaky-clean Canadian travel buddy got ‘hookah-ed’ – admittedly after a coughing fit, going a shade of green and complaining of ‘head spins’! He’s decided he liked it and wants another ‘Shisha session’. Our exuberant Shisha ‘mentor’ at Friends@Cafe on Rainbow Street. But it hasn’t all been smoke-filled coffee dens. We stopped at an antique shop this morning and spent a good hour talking to the owner and his son. Originally from Kuwait, he became displaced during the Iraq invasion in 1990. This seems a common story in this country, which appears to be a safe refuge for people displaced from many of the Middle East conflicts. refugees in desert camps in the north of the country – Syrians who have crossed the border into Jordan less than a 100km away from us, fleeing their country’s bloody civil war. The Amman airspace has constantly been criss-crossed by large grey military aircraft since our arrival, and our hotel is full of UN staff on a week’s R&R. Anyway, I digress. The proprietor specialised in Arab antiques along with a strange mixture of European pieces, with a special display devoted to Nazi memorabilia. Mike left the shop with a hundred year old Bedouin ring. Silver, quite intricate, quite large, with a large red stone on the top with an Arabic engraving. Basically, something Liberace or Liz Taylor would kill for. Even he admitted that he probably won’t ever wear it. 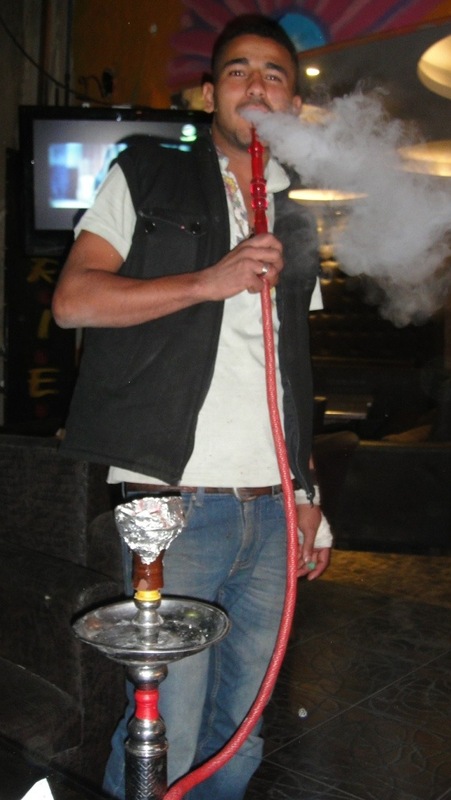 This entry was posted in Jordan and tagged Amman, antiques, Citadel, Jordan, Shisha. Bookmark the permalink.